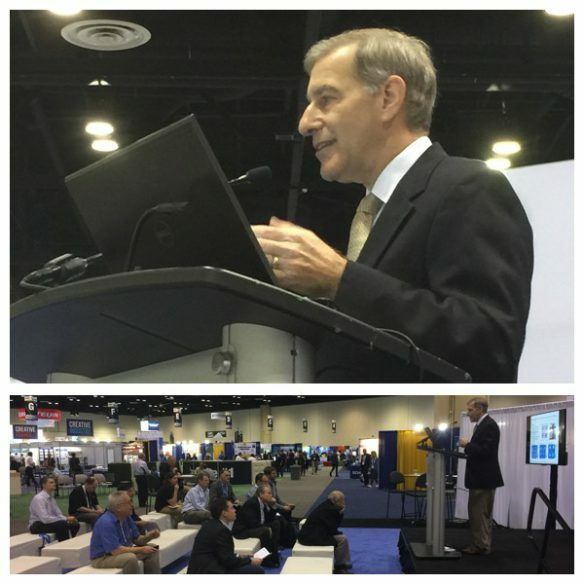 Huber’s Mitch Halpert (top photo) was a featured speaker yesterday at The Composites and Advanced Materials Expo (CAMX), discussing our exclusive line of Martoxid® TM Thermally Conductive Fillers. An engaged audience listens intently to the special technical presentation in the bottom photo. It’s been a fantastic week in Orlando, Florida, as we’re exhibiting at The Composites and Advanced Materials Expo (CAMX) being held at the Orange County Convention Center. A key annual event that we always look forward to on the calendar, CAMX was originally scheduled for September, but was postponed to this week due to Hurricane Irma. 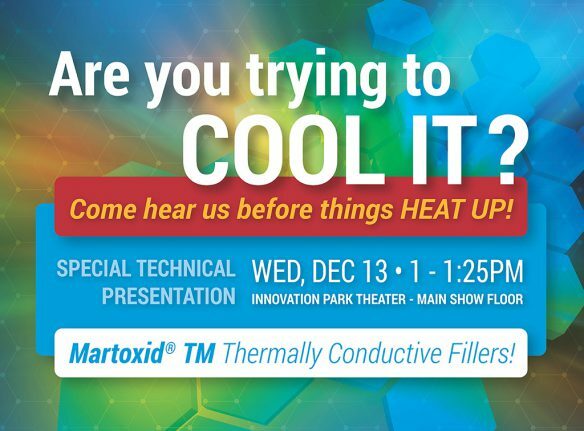 A terrific highlight of CAMX for us: we indeed cooled it down yesterday for attendees successfully giving a special technical presentation discussing our exclusive line of Martoxid® TM Thermally Conductive Fillers. They allow up to 3 W/(m.K) thermal conductivity while maintaining insulative properties in small electronic parts used in composites-related applications. A number of CAMX attendees attended the early afternoon session. At our booth (#E2), we’ve had a number of engaging and interesting conversations with CAMX attendees. In addition to the Martoxid TM Thermally Conductive Fillers, we’re showcasing our array of Halogen-Free Fire Retardant Additives, Calcium Carbonate Extenders and Cast Polymer Performance and Solid Surface Materials. 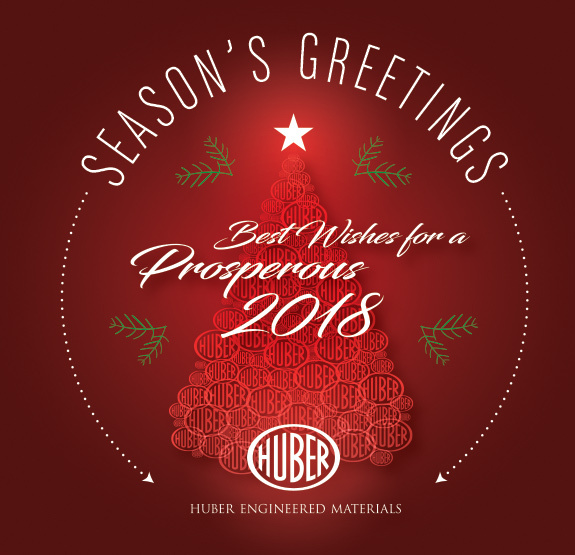 As the show enters its last day today, we’re excited and looking forward to wrapping what’s been a successful event and following up with attendees who’ve stopped by to learn more about the variety of engineered specialty ingredients we offer. 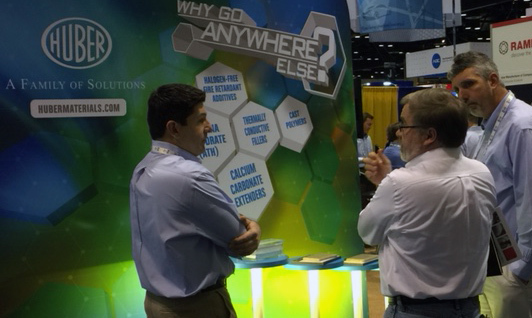 Huber’s Omar Mureebe (left) and Mark Herndon (right), discuss our array of specialty ingredient solutions with a CAMX attendee. Before Things Heat Up, Plan Now to Attend Our Special CAMX Technical Presentation! As The Composites and Advanced Materials Expo (CAMX) in Orlando, FL is upon us, we’re excited to tell you about a special technical presentation that’s headlining our presence at the event. We’ll be introducing our exclusive line of Martoxid® thermally conductive fillers. They allow up to 3 W/(m.K) thermal conductivity while maintaining insulative properties in small electronic parts used in composites-related applications. You are cordially invited to join us Wednesday, Dec. 13 at 1 p.m. as we gather on the show floor at the Innovation Park Theater for the 25 minute presentation. While at the Orange County Convention Center for CAMX, be sure and stop by our exhibition inside booth #E2 and enjoy our hospitality and learn more about the array of other specialty ingredients we are featuring in addition to the four series of Martoxid TM products: our halogen-free fire retardant additives, calcium carbonate extenders and cast polymer performance materials. We’re excited about heading soon to Orlando for an event we look forward to annually. See you in Orlando!